(From left to right) Angelo Baldado, President Dale Whittaker, Forrest McClellan and Jaycee Cureton. Photo courtesy of Angelo Baldado. 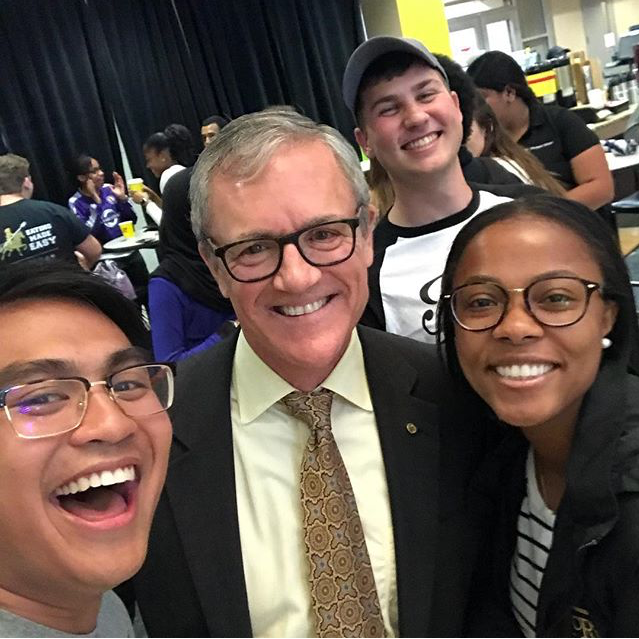 President Dale Whittaker spent part of his first day on the job speaking to students at a “Coffee and Conversation” event, discussing their expectations and hopes for the university’s direction under his leadership as UCF’s fifth president. The event, hosted Monday morning in the Student Union, offered students free coffee courtesy of Cafe Bustelo as well as the opportunity to make conversation with President Whittaker, who spent 45 minutes speaking to several groups of students in attendance. While President Whittaker did speak about his own priorities for UCF, his focus was primarily on the students he spoke with. One of President Whittaker’s largest challenges is leading UCF to become a Preeminent State Research University, a status that grants additional state funding to the university’s graduate programs. Florida State University, the University of Florida, and University of South Florida are also Preeminent State Research Universities. Three years ago, UCF had only reached two of the 11 criteria necessary to receive preeminent status. As of the 2017-2018 school year, UCF had knocked out seven — and President Whittaker believes the number will be higher next year. Some expressed concern about President Whittaker’s ability to both continue former president John C. Hitt’s legacy and establish his own, but Whittaker said he’s planning to stay here long-term to continue UCF’s mission of excellence.